I knew when stepping ashore on terra firma that I would bond with Australians as my fore parents had done, particularly when greeted by every Australian we met with a ‘G’day mate’ (‘Good day friend’), and maybe part of the reason also was because Africa and Australia had always had a close relationship with each other. It had been very close when Australia was joined to Africa in the Southern Continent known as Gondwanaland, and then broke away some 50 million years ago to drift north to form its own continent. Also, since modern times Australians and South Africans have fought side by side in not only the Anglo-Boer War in South Africa but also in World War 1 and World War 2 in North Africa and further afield. Plus their English history and influence, comradely competitive spirit in sport, similar climatic conditions, and a living environment that has seen an influx of immigrants from African countries been accepted in Australia. The first place of residence I found was in the Melbourne suburb of Bentleigh, a three bedroom unfurnished unit handy to a shopping area, Catholic Church and schools, bus and train transport and the beach. With no furniture except a hired television set, we camped out on the floor that night. With the telly glowing in the dark as our fireplace back home had done, and with takeaways and snacks to sustain us, Joan and the children who had never watched television before because it wasn’t operating in South Africa as yet, watched all night through to the morning. Our packing crates which contained our crockery, cutlery, bedding, personal belongings and my tools were due in that week, so Joan and I after enrolling the children into school went furniture shopping after first withdrawing some of our hard earned South African cash from the bank. Actually I was quite surprised when after ordering bedroom, dining, lounge, kitchen furniture, other house-hold appliances and a present for Joan of one of those new-fangled hair contraptions, and paid cash, that the shop assistant made the comment that I had a lot of lolly (money) while eyeing me up and down; maybe she thought I was a sugar-daddy. However, what I learned that day was my introduction to a good credit rating by that store for further purchasing, oh yes, just remembered the store was called Billy Guyatt’s. My first place of employment the following week was at a lounge furniture-manufacturing factory in Chameleon, which was in close proximity to Bentleigh by a bus drive, where I only worked for three months. After finding out that they were under paying me due to their misguided belief that as a new immigrant I didn’t have the same expertise as Australians, I didn’t do my block (Australian colloquialism = lose your temper), I just left. I was earning much less there than earning in South Africa, which didn’t make sense to me even with the South African rand a shade lower than the Australian dollar, but my next place of employment doubled that wage. Swiftcraft boat builders in Mordialloc, which is Aboriginal meaning ‘Little Lagoon’, had a contract to manufacture twenty ship to shore motor vessels for the Australian Navy, which as a shipwright when employed at Louw and Halverson in Cape Town’s shipyard I worked at manufacturing all types of boats, and they employed me to work on the prototype. It wasn’t at first a walk in the park because everything was drafted to specifications, but luckily my technical skills learned at Cape Town Technical College did me in good stead. Australian Navy Inspectors were also there to oversee the whole operation to its completion, and when it was eventually acceptable, we were then able to operate a production line of three at a time. I then became involved in the final finish, and sea trials that too place in Port Phillip Bay of Melbourne, which took me back to my Merchant Mariner days when cruising and putting the boats through its paces. I was commuting there by train and bus, and because of the constant power strikes it was difficult and impossible at times to get to work, so it then became imperative to obtain a driver’s license and to purchase a car. That was easier said than done, for in South Africa because of the excellent transport system cars weren’t much of a necessity, so I took my first driving lesson with trepidation. My worries were uncalled for because of having been that adamant to obtain it I took to driving as a fish takes to water. My female instructor although a very good teacher was also good at cracking onto me (making advances), and after my reverse parking instructions in between her set up space sticks in the same deserted side street each time she would stay parked, wanted to know all about me and became real chummy. She wanted to play games and I wanted my driver’s license and car, so by compromising that if we both concentrated on just getting my license first for me to fulfill my desire to have a car I would be able to satisfy hers. I had no intention of doing that, she though was gullible enough to believe me to really put every effort into the following three instructions by putting the chat times into more productive driving methods, and then booked me in for a driving test. She had informed me of all the driving pitfalls to avoid and of the comprehensive road tests involved. The driving inspector was either in a hurry to have his lunch, for it was that time, or I did everything correctly before driving out of the testing yard. All he asked me to do was to drive around the block, stop where cars were parked along the road, and to reverse into the only car space left in between them. My driving instructor had taught me well, for without looking behind me and by only using the rear and side view mirrors, my one off against the kerb and in between the two parked cars reverse action, which he checked by opening the passenger side door to have a look, must have either impressed him or thought it a fluke. Telling me to drive out onto the road he suddenly stopped me again and told me to reverse back into that position. Receiving the same results he instructed me to turn into the testing yard, which was in the same street, and I received my driving license with a five-minute drive. My driving instructor’s face fell on seeing my quick return thinking that I had failed. After explaining what my test had consisted of and thanking her for that skill taught, she took advantage by not only shaking my hand but also to be all over me like a rash (unable to keep ones hands off through desire). I thought that a bit over the top, she more so when suggesting that we go to her home to celebrate. My excuse that having made previous arrangements with a car dealer and that my next priority was in purchasing a car according to our agreement didn’t go down well, but she relented when seeing I was serious. Waving her on after dropping me, the car purchased was a 1968 Ford sedan. The car dealer was quite amused when telling him that my money was in the bank and if he drove me there to withdraw it we would have a deal. He locked up his car-yard, took me and I drove my car home. My family had no idea of my purchasing of a car on the same day, so they were quite surprised and thrilled on hearing the honking outside and seeing me in the car. They weren’t game though to go for a drive seeing that I had just obtained my license, a car and the first time really driving on the road on my own, but a bit of gentle persuasion and bribery of treats did the trick though. A year after arriving we became Australian citizens and it was a pleasure to relinquish our South African passports, and having the car made it easier for us to see and experience our new environment of Australia. It also made it convenient for seeking a more lucrative employment position, and with my testimonials, certificates and trade papers I procured a leading hand’s position at Fairline Furniture in Cheltenham, which was in the vicinity of our home. It was an established firm manufacturing upholstered lounge suites and it was also the first time for me to be in a supervisory capacity to a mixed ethnic group of workers. That was my introduction to the Australian idiom of ‘avago’ (have a go; encouragement), and I did give it a go. The foreman though was a fiery Italian who insisted that all work be done to his methods. It made him feel though that we both were from the old country by me having the surname of Lorenzo, and my few and far in between suggestions to improve production was accepted. His fiery temper though was too much for the workers to accept and was too hot for him to handle. In one such outburst he physically assaulted a worker by hitting him with a G-cramp after having a verbal blue (argument) with him, and I had to drag him away before he continued the assault on the worker. The injured worker who was lying unconscious and bleeding from the wound to his head resulted in the foreman’s dismissal and my promotion to foreman. The workers had been taught set production methods, which I found antiquated to my expertise in effective incentive production, and my introduction of improved production methods at first reluctantly received, was firmly established when the work methods became more simple and easy and they were still earning their usual amount of incentive bonus. My methods used was standard procedure in South Africa, and by updating cutting list to reduce timber off cuts, produce setting boards that depicted furniture component parts in its original size with all cutting angles demonstrated, all component parts of the lounge suite that required intricate machining, jigs for machining multiple amounts of component parts and for assembling of component parts to lounge frames, and an assembled prototype, it reduced the production cost and increased productivity automatically. They were a good mob with a mixture of Aussies, Pommies, Greeks, Ities, Czechs, Jerries and thrown in for good measure a fellow South African. He too was in timber manufacturing, and by then I required a leading hand because I was becoming more involved in developing new designs, which had become my forte, that saw the firm then producing show wood lounge suites, occasional tables, recliner chairs and sofa beds. His duties consisted of controlling the production flow of the timber yard, timber machining and assembling, springing up and foaming, and the spraying section. I had done all of that when on my own, plus ordering of raw materials, administration, the improved production methods and the developing of new designs. So I also instructed him that in his down time to organize maintenance of machinery and equipment, accept deliveries and maintain the department in ship shape condition. He lasted the whole of four months because while I was going flat strap he would be instead yabbering (talking) away to the workers who were trying to earn extra bonus money by keeping the production flowing. In the centre of our department was a large pig iron potbellied stove in which in winter was continually fired up by either of two labourers to warm the department. That was a duty he rather preferred to do, and would stand there warming him while feeding it timber off-cuts and the workers had to warm themselves through working. They didn’t have to dob (inform) on him to me for he was doing it to himself by having been such a nong (fool) for making it so obvious, but what really did it for me was when he made the rather going against my grain remark that we South Africans must look after each other, which didn’t sit alright with me having almost become a true blue (genuine) Aussie. Wanting to experience our new Aussie environment my family and I became Aussie tourist, but more so me who saw a whole new continent to explore. Starting from my home city Melbourne in the state of Victoria that nestled comfortably on the banks of the Yarra River, I found it to be a city of European tastes, genteel and refined with its fashion, theatre, art galleries and restaurants. With its melting pot of cultures, which goes to explain it as having the largest Greek population outside Greece, there was no greater contentment than spending time as Melbournians in the Royal Botanic Gardens that undulated beside the river. I found my tranquility there amongst the wooded green lawns, fern grottoes, native and exotic plants and watched black swans cruise regally by. 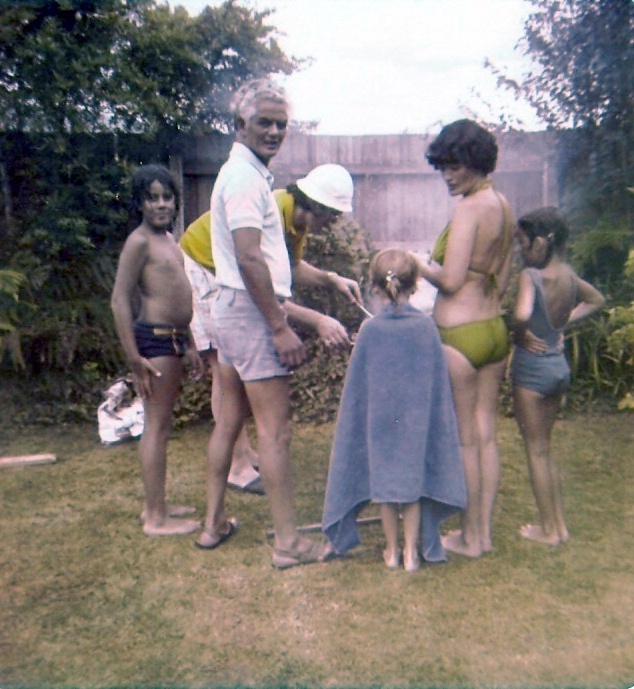 It reminded me so much of Cape Town’s Botanical Gardens of my youth with children running freely about seeking new adventures under the watchful eyes of parents, hand-holding couples, sun-worshipers and elderly couples watching and reliving their youth. However, the only difference was the Greek families that it seemed had brought everything but the kitchen sink with them with an array of dining arrangements, crockery, cutlery, enough food to feed an army and of course their bouzouki music and dancing. Also, as a family in that same area in summer we would attend the outdoor performances at the Meyer Music Bowl under the stars at night, and the day outdoor theatre ones. I didn’t also have to be a rocket scientist to work out that Melbournians were sport crazy. 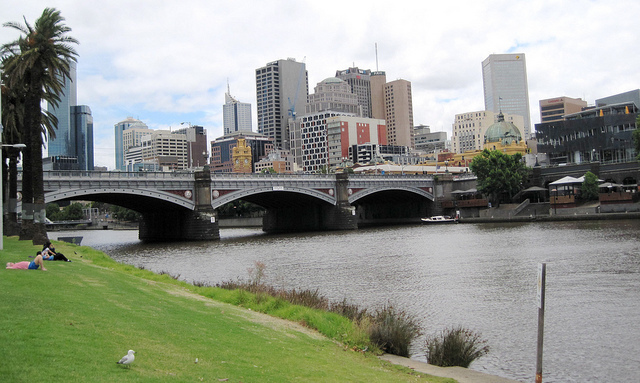 Yarra Park near the river contained the Melbourne Cricket Ground for inter-state and international matches and the Australian Rules Football Grand Final, and also the National Tennis Centre that hosted the Australian Opens. The other major sporting events were the Melbourne Cup at Flemington Racecourse and the Australian Masters Golf Tournament. Be that as it may, it took nothing away from other sports such as soccer that saw Sunday league matches competitively played amongst ethnic teams that had their supporters barracking (supporting) with country of origin flags, banners, drums and at times running fights if the opposing team lost. And then there was ‘the game that is played in heaven’ according to its devotees like myself of Rugby Union, which unfortunately I found was only mostly enthusiastically played at colleges; however, my other love of athletics and swimming saw me wallowing in a fest of those events that had world class and Olympian champions amongst them. We also found the old and new trams that rattled along the city streets and into the suburbs an exploratory experience that took us for a taste of Melbourne’s immigrant legacy. Chinatown’s distinct ethnic area was due to their gold prospecting ancestors who joined the gold rush in the 1850s, the Spanish quarter in Johnston Street was lined with tapas bars that pulsated at night with salsa and flamenco dancing, a Little Italy in Lygon Street that waves of post-war Italians adopted as their own and was inundated by their influence of trattorias, bistros, pizzerias, coffee bars, noisy bars and cruising young Italians. And then there were the Jews in Acland Street in Saint Kilda, which they had made their own community, and because Christian Sundays were not theirs it was a busy shopping centre with palate delighting delicacies of Tel Aviv, Vienna, Prague and Budapest, and last but not the least the Greeks who had taken the proverbial kitchen sink to Chapel Street with their inundation of restaurants. I found that Melbournians just loved markets, and it ranged from flea, arts and crafts, exotic foods and the biggest of all the Queen Victoria Market of every imaginable fruit and vegetable. Although the city had smoothness about it in the environment and the gentle flowing river with its pleasant boat cruises, canoe paddling, riverside bicycle paths and beautiful old river-crossing bridges, there was a rough element. It was all due to the city facing the large spacious Port Phillip Bay into which the river ran that lead of Bass Strait in the Tasman Sea. It was not only when sailing out on the bay where it would become a challenging and sometimes a dangerous pursuit when conditions would change radically and without warning due to gale force winds that would wipe up and sweep the bay, but it also would send boats, fishermen, bathers, promenades, alfresco diners and pedestrians scurrying for cover. Another fascination they had, and so did the whole of Australia, was about their legendary folk hero Ned Kelly who had been the most infamous bushranger of Victoria, and we viewed the scaffold from which he was hung in 1880 at the Old Melbourne Goal, and his death mask. To go further afield I traded the car for a Ford Falcon sedan and then we were crisscrossing the State of Victoria. On going around Melbourne we came upon Mount Macedon, an extinct volcano with rocks formed by solidified lava and erosion, which was depicted in the movie ‘Picnic at Hanging Rock’, and I also came to know about the ‘magic mushie’; an hallucinogenic mushroom. Mount Donna Buang, an Aboriginal name meaning ‘the body of the mountain’, we found was the closest snow to Melbourne for sightseeing and tobogganing, and where the children had their first snow fight and built a snow man. Mount Baw Baw, which is Aboriginal for ‘echo’, was a novice’s ski resort, which they were a bit reluctant to try, but Mount Buller, which the Aboriginal name for the mountain is Bulla Bulla meaning good, Mount Hotham and Falls Creek that were alpine ski resorts, got them all enthused. Our favourite though was Lake Eildon. A body of water formed from the damming of five rivers to irrigate the farmlands. Be that as it may, we though found to our pleasure that it was also a year round water recreation and holiday resort paradise, which saw us returning there frequently, and on the way there we had also come across Healesville Wildlife Sanctuary that was Australia’s best nature fauna reserve that played a key role in replenishing some of Australia’s endangered wildlife. Dandenong Ranges, which the Aboriginals call Corrhanwarrabul – meaning a desirable place where birds sang, kangaroos jumped and lyrebirds perform, although of panoramic views didn’t have a touch on Table Mountain, Puffing Billy though made up for it with a scenic mountainous railway ride. Latrobe Valley, which sits upon the world’s largest deposit of brown coal, as an industrial heartland of coal mines and power plants reminded me so much of Wales in England, but in contrast its coastal area of a huge granite peninsula that was Wilson’s Promontory on the southernmost part of Australia’s mainland and a national park and holiday area. Sale bore the title of ‘Oil City’ because of the oil and natural gas gathered from the rigs offshore in the Bass Strait with its processing plants and supply ports ashore. And it was a pleasurable way to spend a Sunday arvo (afternoon) with family and friends while observing the operations at an adjacent park lunching on parcels of fried fresh fish and chips washed down with chilled white wine purchased locally. Lakes Entrance we found was Australia’s largest inland waterway system with water oriented activities, the largest fishing port in Victoria and Ninety Mile Beach of coastal sand dunes that separated the lakes from the ocean. The Wilderness Coast we found relatively uncrowded, unspoiled and undeveloped due to its remoteness. Phillip Island was another holiday resort but with a fairy penguin colony and their parade as they returned from the sea to nest at nights and Australia’s second biggest tourist attraction, with an added attraction of Australia’s first motor racing circuit (1928), which today hosts the Australian 500cc Motorcycle Grand Prix. Our next outing took us to Ballarat, aboriginal words meaning a camping or resting place, which was within an hour’s drive from Melbourne, with its rich heritage of gold rush days and the best-preserved and impressive Victorian street-scapes in Australia. A signpost pointing to Eureka found us at a site and name that was etched into Australian history, and the diorama there depicted the event. In December 1854 when the gold diggers angered by government oppression stood up for their rights at the Eureka Stockade, troops were sent in to storm it and twenty-two diggers lost their lives. Because of their mate-ship and sacrifice it became a pivotal point for Australian republicanism, which is still experienced today, and the Eureka flag remains a strong Australian trade union icon. Ballarat of the 1850’s we found was recreated in Sovereign Hill, which had been another gold-mining town, with its old fashion wooden shops, and we watched blacksmiths and tinsmiths at work, had our faces imprinted on ‘Wanted’ posters at the old press in the Ballarat Times office, took a ride on a Cobb & Co coach and panned for gold in a creek. Bendigo with a past history too of gold-mining had underground mine tours, with a Chinese Joss House, temples, tea-houses and festivals as a reminder of their gold-mining heritage there. Further north the ‘Goulburn’ River, an aboriginal word meaning a camping or resting place, which met up with the Murray River near Echuca, an Aboriginal name meaning “Meeting of the Waters”, that wound through Goulburn Valley and was Victoria’s fruit bowl with Shepparton operating the largest cannery in the southern hemisphere. The Murray River of winding waterways with paddle steamers from riverboat era took in Echuca, Swan Hill and Mildura, and was Australia’s most important inland waterway for agricultural irrigation. Travelling through Melbourne we eventually found the Hume Highway that connected Melbourne to Sydney and took in Benalla, Aboriginal word meaning ‘big waterholes’, which was part of Ned Kelly’s territory. Further on Wangaratta, meaning resting place of the cormorants’, which was the heart of ‘Kelly Country’, and Glenrowan where his legendary exploits told of him and his gang capturing the town to hold the townsfolk prisoners in the Glenrowan Inn because of a trainload of police that were on their way to arrest them, which caused him to have the tracks ripped up. All the same, it all came to a bloody end with him been shot but not killed while in his suit of homemade armour trying to escape after a furious shootout and captured, and his gang died within the torched hotel rather than surrender. The town of Wodonga, which means ‘bulrushes, was the end of the trail for us in Victoria because it ended at the Murray River, which was the border into New South Wales, and although we had only crossed and visited its twin town of Albury, I knew that I would be back to complete the touring journey of New South Wales from that designated town. So also by now, those reading this are well on the way to understand certain Australian slang words and Aboriginal words as I do. Melbourne City on the Yarra River. Our first picnic outing given annually by Fairline Furniture for its Staff and workers with Moi, Joan, Greg and Gina. 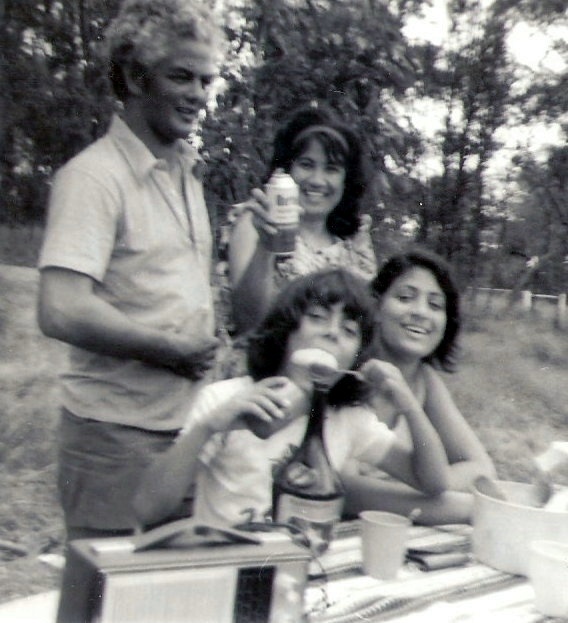 Our first back-yard barbeque with son Greg, Brother-in-law Arthur from Vanguard Estate episodes, Moi, Sister Rita and their two daughters Debra and Toni. 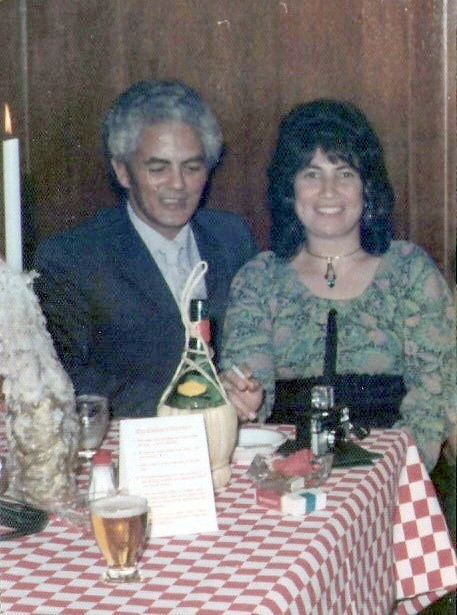 Harold and Joan on their first Australian date at the Cuckoo Restaurant. 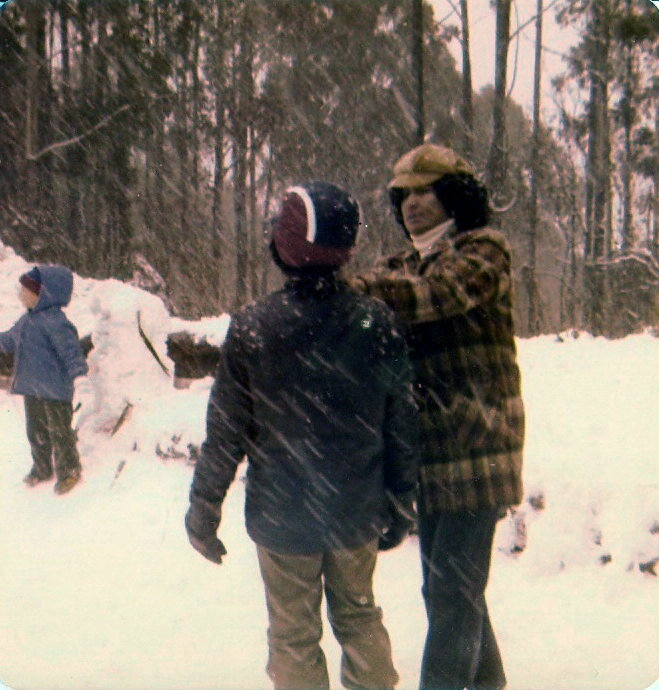 Greg and Joan seeing snow for the first time at Mount Baw Baw. 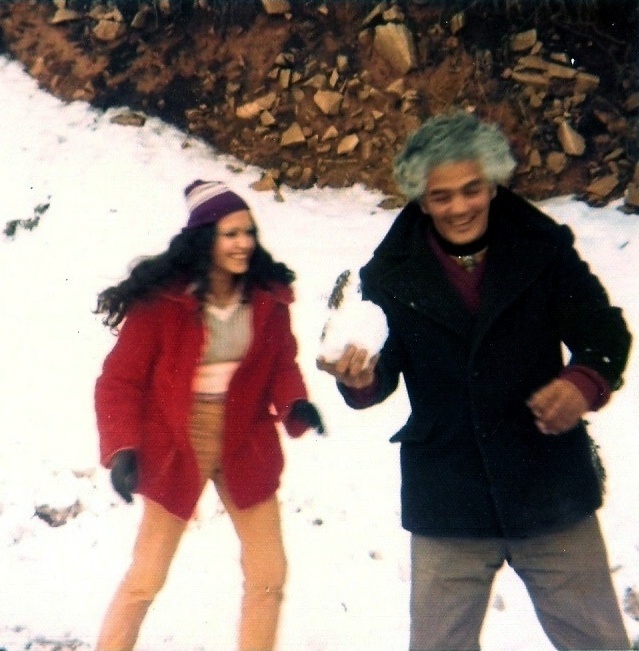 Gina and Harold having a snow fight on Mount Baw Baw. 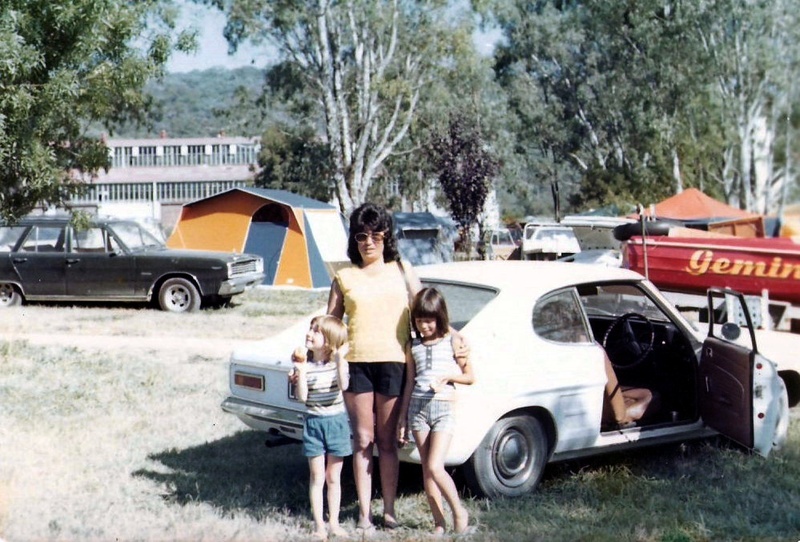 Camping at Lake Eildon with Joan, my nieces Debra and Toni and my latest addition of a Ford Capri. 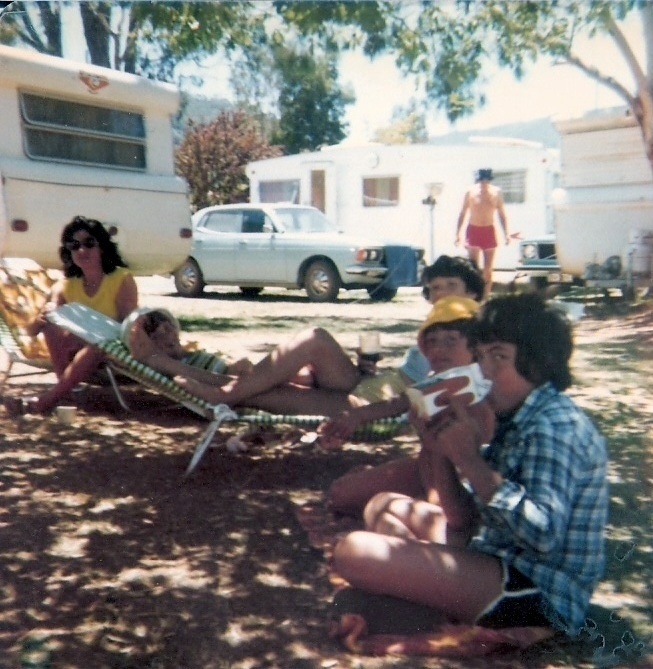 Chillaxing at Lake Eildon with Joan, Debra, Rita and Greg. 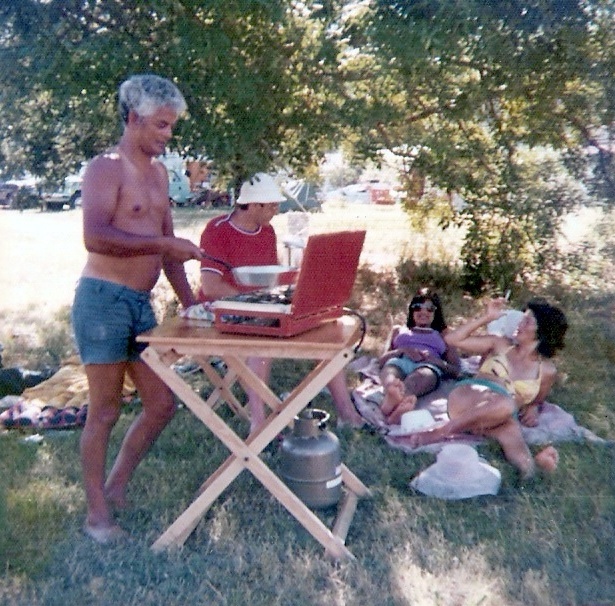 All the camping mod-cons with Chef Harold, Arthur, Gina and Rita at Lake Eildon. 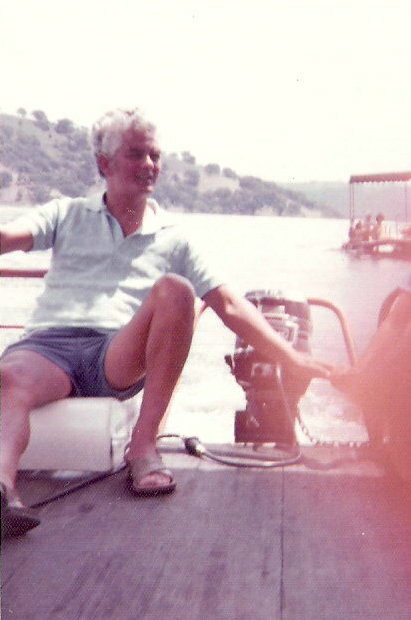 Skipper Harold boating on Lake Eildon. You would of worked for my uncles Frank & Don Gibbins at Swiftcraft bacj in the day. You are spot on and what great employers they were. They really practised the Australian saying of giving one a go and they reaped the benefits from their employees. Cheers!